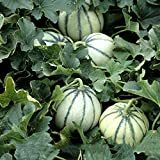 Charentais melon growing herbaceous semi vine of the genus Cucumis also known as Cucumis melo or Musk melon, Charentais melon annual plant, can grow mediterranean, desert, subtropics, temperate or tropics climate and growing in hardiness zone 4+. Leaves color green in heart shape with lobes. Flower color yellow with five lobs, female contain semi fruits that looks like a little melon, and male flower are smaller. 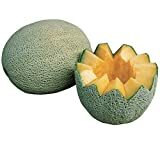 Fruit color orange-yellow inside and yellow with green stripes the peel with like net structure, the fruit juicy sweet, peel is not edible, the structure smooth or rough structure, after the picked need to give time to be ripen, seeds also edible. 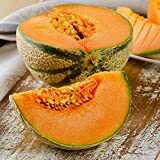 10+ Charentais, "NON~GMO" French Heirloom Cantaloupe~Melon Seeds, Juicy & Sweet. 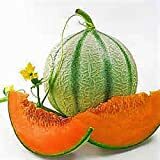 What can be done with big quantities of Charentais melon fruits?